For decades it has been believed that social class was the key determinant behind the outcome of a general election. The shock result of the Conservative Party failing to achieve an outright majority, with Jeremy Corbyn’s Labour Party hard on its heels, has demolished this notion. On June 8, with a turn-out of 69 per cent, Theresa May’s Conservative Party won 42 per cent of the popular vote with Labour getting 40 per cent. Sociologically, the Tories have managed to get the support of a huge section of the professional and white-collar middle classes with Labour winning votes from the blue-collar and blue-blouse working-class. Class de-alignment finally came of age last week. For the political scientist Robert Ford, age has overtaken class, to become one of the key cleavages in British politics. Labour, the party of working people and their families, with an emphasis on wealth redistribution from the well-off to those on modest incomes, gained increased support last week in seats with huge concentrations of middle-class professionals. The Tories, the party of big business and “Middle-England”, made significant gains in the poorest seats. The richest constituency, Kensington went Labour for the first time while the former working-class mining seat Mansfield went Conservative on a staggering 18 per cent swing. Even Bishop Auckland in County Durham narrowly escaped becoming a Conservative gain by 500 votes. So “age apartheid”, with a generational divide in voting habits and political attitudes, has become a feature of Brexit Britain. For Stephen Burke, director of the think tank United for All Ages, ‘’Britain is increasingly divided by age and generation’’. The UK has an ageing population. In 2016 the over-65s numbered 12 million, exceeding the number of those under 18. There is a dominant view that Britain’s elderly carry significant political weight, the so called “grey power”. It’s also broadly the case that the older a person gets, the more likely they are to vote. Turn-out amongst the over-55s was 75 per cent in the 2015 election, compared to a 43 per cent turn-out amongst the 18 to 24 age group – though turn-out amongst the young soared to 64 per cent in the 2017 election! There is a tendency for younger people to vote Labour and older people to vote Conservative. In Labour’s 1997 landslide it did better in all age groups, except the over 65s who stuck with the Tories. Four years later, 47 per cent of the 18-24 year old voters supported Labour, compared to 29 per cent who backed the Conservatives. By 2017, according to professor John Curtis’s massive exit poll, some two-thirds of the 18-to-24 year group backed Labour. Amongst workers aged 55 to 64, only a third backed Labour with almost half (47 per cent) backing the Tories. Six out of 10 pensioners voted Conservative with less than quarter backing Labour. In 1974 David Butler (now aged 92), the top elections guru, wrote of “senescent Conservatism”, the idea that the closer you are to being senile, the more likely you are to become a Conservative. Amongst sociologists there remains a debate as to why this is. Some researchers argue that older people are more conservative with a small “c” – more committed to traditional norms and values. Amongst older people there’s more support for the Conservative Party, perhaps reflecting a more restrained view on issues of personal morality, drugs, membership of the EU, immigration and sexual orientation. This may be related to a political upbringing formed by age-generational experiences during their formative years. Others have suggested that as people get older they become more cynical about social change at home and abroad. Most have mortgages to pay off plus other costs to do with family responsibilities. Survey evidence indicates that many are alarmed by high taxation to fund public services. Once their finances are more secure in their sixties then they may resent having to pay more for social welfare for other age groups. At the other end of the age spectrum, young people are more radical, and more open to change and new policy ideas. As shown in the 2017 election they tended to see Labour as closer to their world view. In the last half decade economic opportunities for young adults have shrunk. Dubbed ‘’generation rent’’, many find it hard to get onto the housing ladder with huge student debts hanging over them. Their wages have been hit hard by austerity. Well-paid apprenticeships are too few in number. Housing benefits have been cut as pensioner allowances have increased. Many young graduates end up in non-graduate jobs. Labour’s manifesto promises, spearhead by Momentum on social media – to abolish university fees, restore student grants for further education students, deliver a living wage of £10, more affordable social housing and tackling under-resourced mental health services – resonated with millions of young people. Little wonder they came out for Corbyn in their droves. Corbyn has arguably helped to restore both trust and faith in the democratic process. Until this month, millions didn’t vote. In 2015, some 58 per cent of adults under 25 didn’t cast a ballot despite the best efforts of campaign groups like Bite the Ballot and the NUS. Some cynics saw them as apathetic. Others took a more nuanced perspective. For the sociologist Geoff Evans, many young people were alienated from electoral politics, because of some corrupt MPs, as well as spin doctors, fake news and some Conservative and New Labour politicians’ focus on the negative aspects of young people. Corbyn’s perceived authenticity helped to re-connect the country’s youth to civic participation whilst dramatically boosting Labour’s vote share. Parliamentary seats with large student populations swung to Labour by 6 per cent. 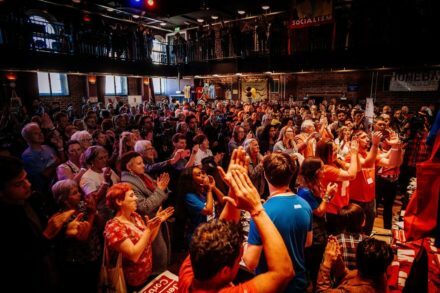 In Brighton, Hove, Canterbury, Plymouth and Portsmouth, Labour’s share of the vote soared by between 16 and 21 percentage points. There was little difference in constituencies with big elderly populations which stayed Conservative. When it comes to voting, the generation gap has got wider than ever before. For Britain’s two dominant parties the future challenges are great. For Labour, despite promises to retain pensioner benefits, they need to win over the hearts and minds of the nation’s older voters in order to achieve overall success at the ballot box. On a broader societal level, more needs to be done by Labour to challenge intergenerational inequality with bold public policies to promote greater integration between older and younger citizens. As Stephen Burke says: “Ending age apartheid and promoting social integration between generations can help build communities and a country for all ages, where we’re united not divided”. In Brexit Britain surely that’s an aspiration worth pursuing for Labour and trade union movement. Stephen Lambert is a Newcastle city councillor and runs social enterprise company Education4Democracy.